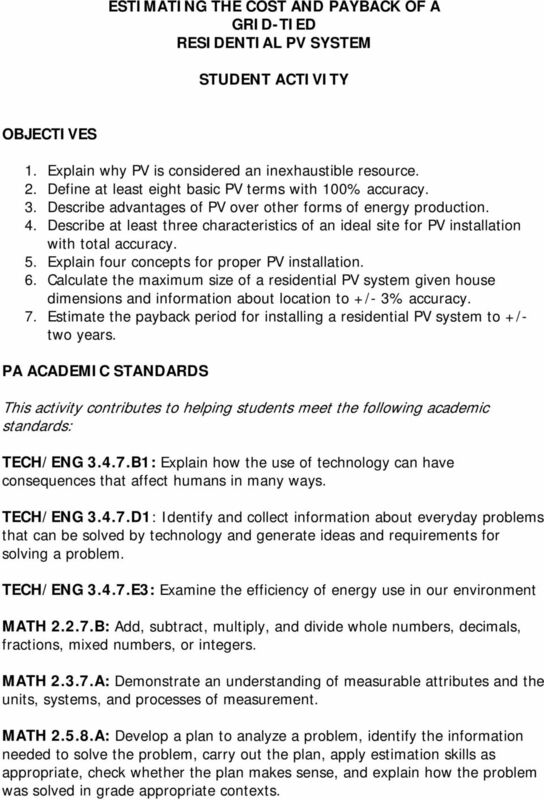 Download "This activity contributes to helping students meet the following academic standards:"
1 ESTIMATING THE COST AND PAYBACK OF A GRID-TIED RESIDENTIAL PV SYSTEM STUDENT ACTIVITY OBJECTIVES 1. Explain why PV is considered an inexhaustible resource. 2. 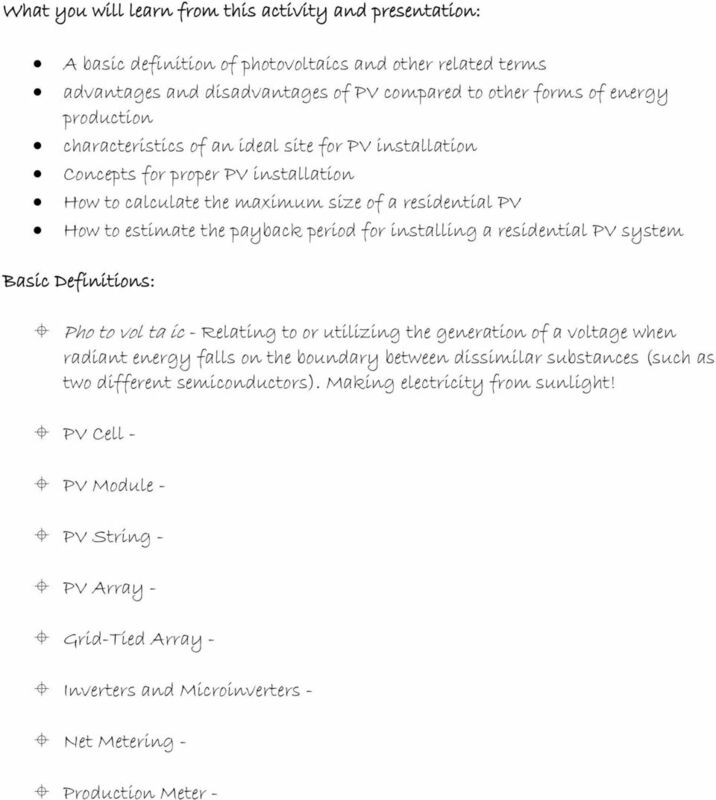 Define at least eight basic PV terms with 100% accuracy. 3. 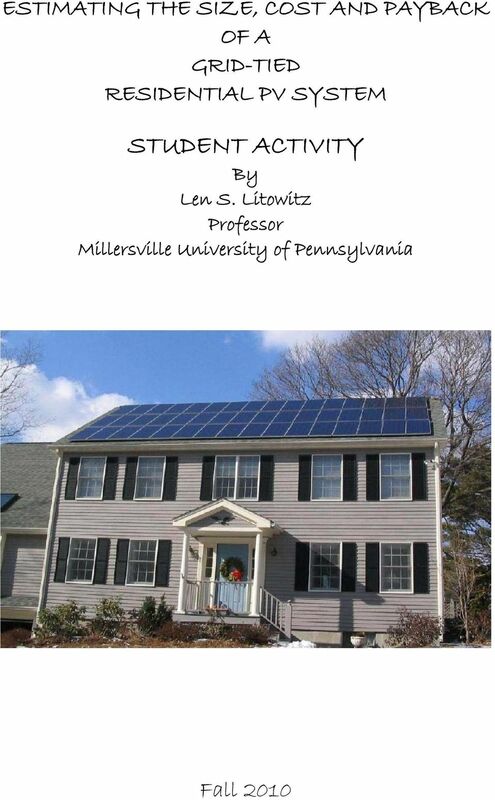 Describe advantages of PV over other forms of energy production. 4. Describe at least three characteristics of an ideal site for PV installation with total accuracy. 5. Explain four concepts for proper PV installation. 6. Calculate the maximum size of a residential PV system given house dimensions and information about location to +/- 3% accuracy. 7. 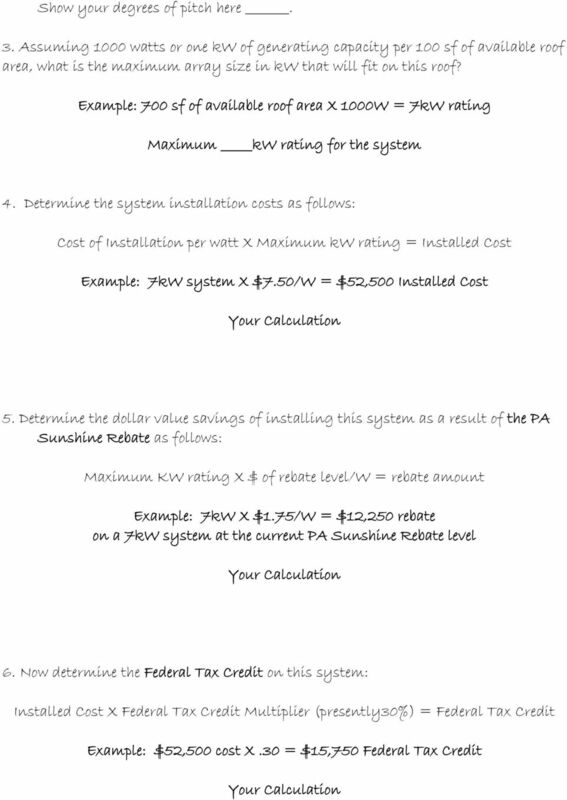 Estimate the payback period for installing a residential PV system to +/- two years. PA ACADEMIC STANDARDS This activity contributes to helping students meet the following academic standards: TECH/ENG B1: Explain how the use of technology can have consequences that affect humans in many ways. TECH/ENG D1: Identify and collect information about everyday problems that can be solved by technology and generate ideas and requirements for solving a problem. TECH/ENG E3: Examine the efficiency of energy use in our environment MATH B: Add, subtract, multiply, and divide whole numbers, decimals, fractions, mixed numbers, or integers. MATH A: Demonstrate an understanding of measurable attributes and the units, systems, and processes of measurement. MATH A: Develop a plan to analyze a problem, identify the information needed to solve the problem, carry out the plan, apply estimation skills as appropriate, check whether the plan makes sense, and explain how the problem was solved in grade appropriate contexts. 2 SCIENCE S8.C.2.1.1: Distinguish among forms of energy (e.g., electrical, mechanical, chemical, light, sound, nuclear) and sources of energy (i.e., renewable and nonrenewable energy) SCIENCE S8.C.2.1.2: Explain how energy is transferred from one place to another through convection, conduction, or radiation. 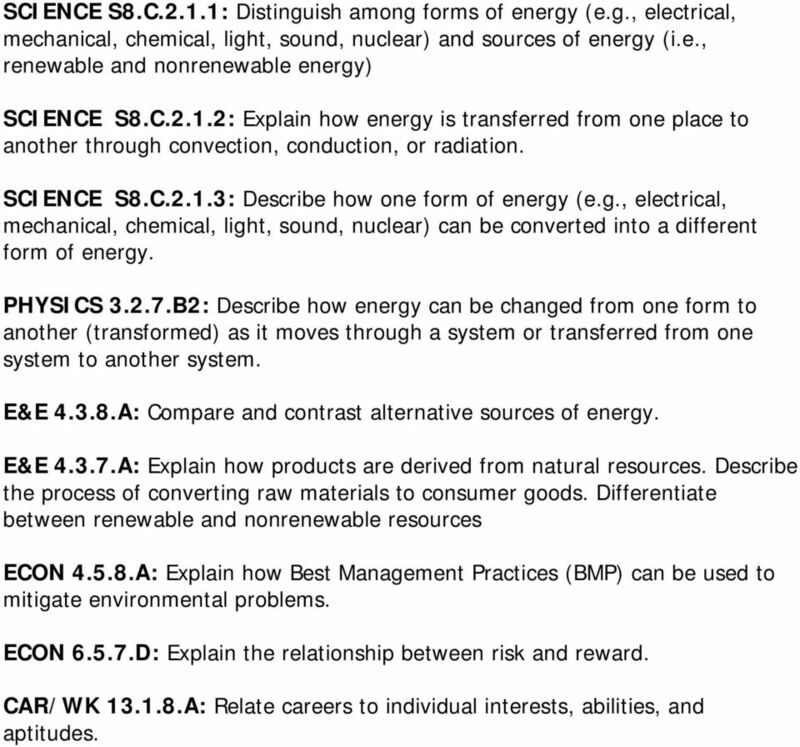 SCIENCE S8.C.2.1.3: Describe how one form of energy (e.g., electrical, mechanical, chemical, light, sound, nuclear) can be converted into a different form of energy. PHYSICS B2: Describe how energy can be changed from one form to another (transformed) as it moves through a system or transferred from one system to another system. E&E A: Compare and contrast alternative sources of energy. E&E A: Explain how products are derived from natural resources. Describe the process of converting raw materials to consumer goods. Differentiate between renewable and nonrenewable resources ECON A: Explain how Best Management Practices (BMP) can be used to mitigate environmental problems. ECON D: Explain the relationship between risk and reward. CAR/WK A: Relate careers to individual interests, abilities, and aptitudes. 5 Sizing a System Where to Start??? 1. Determine the useable square footage of roof area given the following dimensions and these restrictions: Collectors cannot be installed one foot from the sides or ridge of the roof. On the lower side of the roof there is a 16 overhang that cannot serve as mounting space for collectors. Show your calculation here: 2. 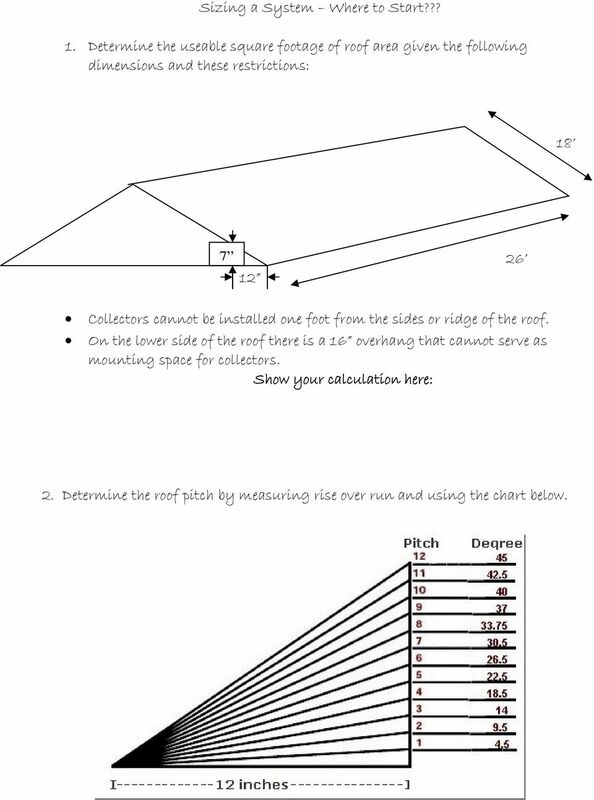 Determine the roof pitch by measuring rise over run and using the chart below. 7 7. Determine net installation cost for the system as follows: Example Cost of the 7kW system = $52,500 PA Sunshine Rebate 7kW * 1000W/kW * $1.75W = -$12,250 Federal Tax to be paid on Rebate $12,250 * 0.28% = +$3,430 Federal Tax Credit $52,500*.30 = - $15,750 NET COST OF INSTALLATION = - $27,930 Cost of the system PA Sunshine Rebate Federal Tax to be paid on Rebate = $ = -$ = +$ Federal Tax Credit = -$ NET COST OF INSTALLATION = $ 8. 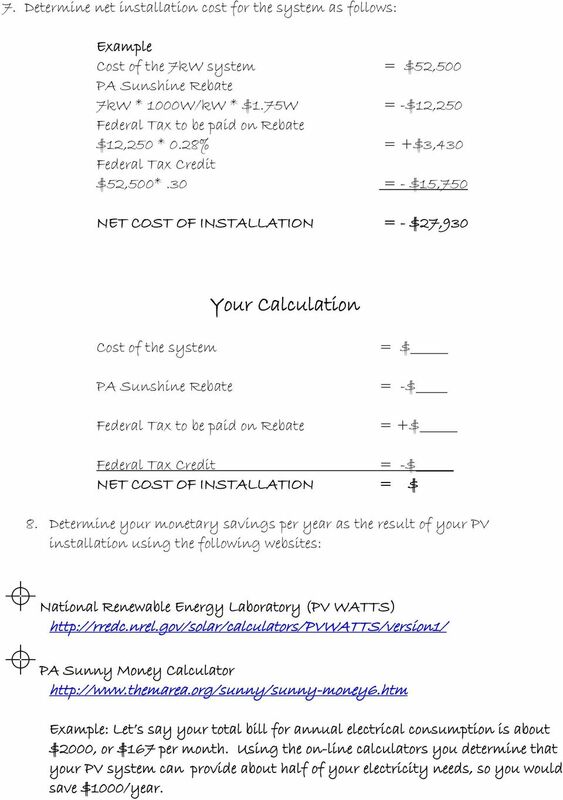 Determine your monetary savings per year as the result of your PV installation using the following websites: National Renewable Energy Laboratory (PV WATTS) PA Sunny Money Calculator Example: Let s say your total bill for annual electrical consumption is about $2000, or $167 per month. Using the on-line calculators you determine that your PV system can provide about half of your electricity needs, so you would save $1000/year. 8 9. Using the PA Sunny Money Calculator determine the number of S-RECs earned in one year and the income you would gain from those S-RECS. 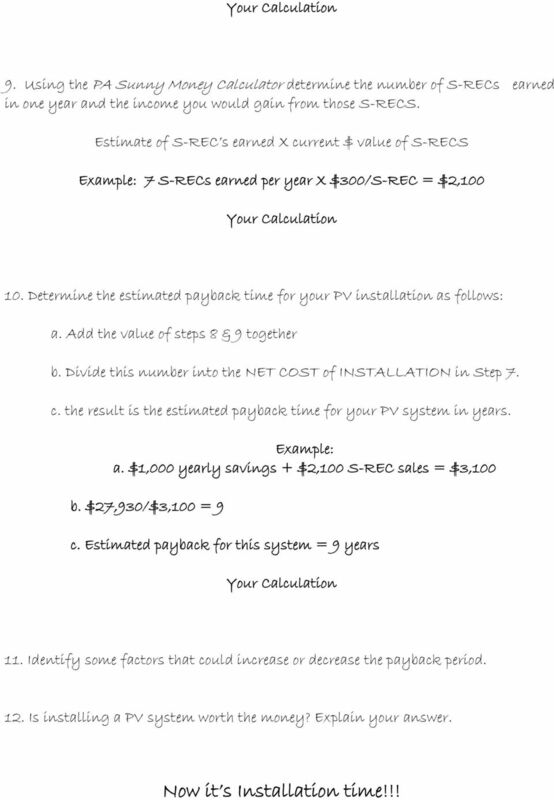 Estimate of S-REC s earned X current $ value of S-RECS Example: 7 S-RECs earned per year X $300/S-REC = $2, Determine the estimated payback time for your PV installation as follows: a. Add the value of steps 8 & 9 together b. Divide this number into the NET COST of INSTALLATION in Step 7. c. the result is the estimated payback time for your PV system in years. Example: a. $1,000 yearly savings + $2,100 S-REC sales = $3,100 b. $27,930/$3,100 = 9 c. Estimated payback for this system = 9 years 11. Identify some factors that could increase or decrease the payback period. 12. Is installing a PV system worth the money? Explain your answer. Now it s Installation time!!! Solar Energy Basics for Homes and Businesses Call Your Electric Cooperative First! For safety and required standards, call your electric power association before investing in solar electric generation.